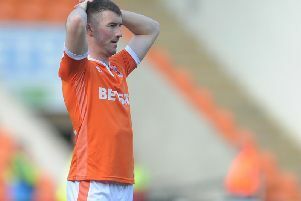 Terry McPhillips lambasted the Bloomfield Road surface after his Blackpool team continued their poor run of form on home turf. The Seasiders slumped to a 1-0 defeat against play-off chasers Peterborough United on Saturday, making it just one win in their last 10 outings at home. Pool were well under par and that, according to manager McPhillips, had a lot to do with the poor state of the pitch. “It’s not really football – it’s fightball the way it bounces about,” the Pool boss said. “But I can’t argue with the players’ fight or their application. When it was put to McPhillips that Pool had not benefited from the rub of the green, the Pool boss joked: “I’m not sure about calling it rub of the green – it’s rub of the brown the way the pitch is! “But we still put them under pressure and you always fancy us for a late goal because we always threaten it. But I don’t suppose you’re going to do that every game. “I can’t fault the lads’ effort. I thought Nya Kirby was terrific, dealing with the ball on that pitch. He kept finding his team-mates more often than not. “The spirit of the lads was there to be seen and I think we’ve proven now that if we’re on a better pitch we do better. The pitch wasn’t the only thing McPhillips bemoaned post-match, also turning his ire to the officials. Posh’s winning goal, which came from Marcus Maddison two minutes before the interval, came after the referee failed to spot what appeared a blatant handball in the lead-up. “In the end we’ve lost a game,” McPhillips added. “They got the first goal after a clear handball in the lead-up to the goal. “I thought the referee was weak and the communication between him and his team was poor but that seems to be what we get. “Despite being the home team, we didn’t seem to get any of the decisions and we definitely didn’t get that crucial one. “It was a difficult pitch to play on but I thought it was handball, so we’re not getting any luck, that’s for sure. “I thought the fourth official has got to join in but he didn’t. I never heard him anyway. “We can all see it – it was clear. We had a perfect view of it. “It’s not just hit his hand – he’s controlled it and that started the move. “Could we have defended the move a bit better? Yes, but there was also a big bobble in there and that’s hard to account for.